I want to wish all of you a very happy Christmas and a wonderfully prosperous New Year. I hope that you will enjoy the festive season with friends and family and that this will be a magical, yet peaceful time for all. Thank you for all the love and support in 2013. I want to say a Big thank you to Alex and the IWSG team, who have been so wonderful this year and who have worked so hard. 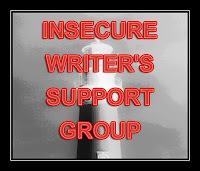 It has been really great being able to connect with other writers and share my insecurities and read/comment on theirs as well. The experience has really been life altering and a comfort. Thank you. I have plenty of insecurities this month, mostly about my writing, but I am not going to talk about them. I am just going to accept that I need to work harder and rather worry about it all next year. For now, I just want to wish you all well. It has been fun this year and I hope that most of you will be feeling less insecure right now. If you are insecure, I am sending you a big virtual hug and hoping it all works out soon, so that you can feel better. If you are not insecure, I am sending you a big high five.